We only supply the best Wild Atlantic Salmon and are recognised as the premium supplier of Wild Irish Salmon. When you select Kerryfish you are confident that you will receive the best Atlantic Wild Salmon. 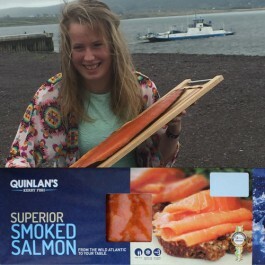 Side of Wild Irish Smoked Salmon, 1.2kg+, Serves 15+ Hand Sliced With over 60 years of experience which began in 1950, Kerryfish and the Quinlan family have become the eminent artisan producer of Wild Irish Smoked Salmon. After careful preparation of the each Wild Salmon, Kerryfish use native Irish oak wood chippings to create Smoked Salmon with a truly brilliant flavour, texture and taste. Kerryfish Irish Wild Smoked Salmon has achieved a reputation amongst connoisseurs of good food for the excellence of its flavour and for its consistent quality. We complement our care and attention to our Wild Salmon products with first Class customer service. We are 100% committed to providing you with a first class product and service from our world-class smokery in the South West of Ireland. Our purpose at Kerry Fish is to delight the palates of families, friends and parties across the globe with premium fruits of the wild Irish Atlantic waters. Our unique smoking technique extracts distinguished flavours from genuine Wild Salmon. This original capability enables excellence in flavour and consistent quality, features that are widely recognised and acclaimed by food connoisseurs. Kerry Fish Wild Smoked Salmon is probably the very best Wild Smoked Salmon in the world… so say our customers and many of the top review magazines and guides. You may be surprised to learn that all our Wild Irish Salmon are caught right here in the clean pristine waters of County Kerry! We are very proud to be one of a few master salmon smokers still using authentic Wild Irish Salmon. Due to our wealth of Wild Salmon expertise, Kerryfish were chosen by the fisheries protection agency to handle, smoke and sell Kerry’s Wild Salmon. Our Wild Salmon are sustainability caught by draft net fishing in Kerry Rivers and we handle each individual fish with tender loving care! Each Wild Salmon is tagged with a unique number and is fully traceable back to when, where and who caught the fish. Smoked Wild Irish Salmon is unique in taste and quality and our artisan traditional Salmon smoking process complement the great flavours. 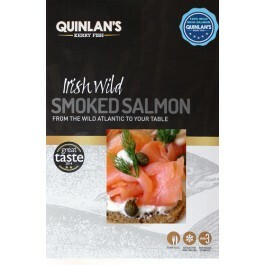 Our Smoked Wild Irish Salmon is available in many differing pack sizes to suit all needs. The deep fine flavour of our Smoked Wild Irish Salmon never fails to impress and we guarantee you will be back for more! Don’t forget to include some as a dinner starter or to send as a special gift. 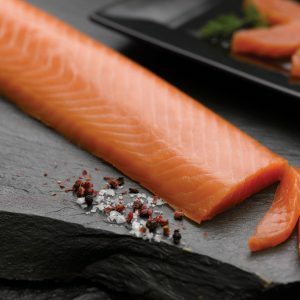 Ordering at our website is secure, fast and easy and with the reduced shipping charges this year Smoked Wild Irish Salmon is even more affordable. If you prefer to call, we are happy to chat about Wild Salmon and take your order over the phone.